After years of space exploration. We'd left thousands of pieces of defunct equipment and other junk in orbit around the Earth.This trash can endanger satellites, astronauts and make it difficult to get off the planet. Some researchers have suggested some very interesting methods for cleaning up space. Here are the craziest ones that just might work! Let's start with every mad scientists favorite toy—giant lasers. From Earth's surface, a laser beam exage the piece of debris in space slowing down the target. Once the trash is moving slowly it will fall towards Earth and burn up in the atmosphere. On the bright side, this kind of device will be based on the ground. However, most nations get a bit nervous when they hear someone's building a giant laser. Which could be used to knock their own satellite up at the sky. So, this is one idea whose time may not have come, yet! Why not tryin old-fashioned method and snare the trash in giant nets? 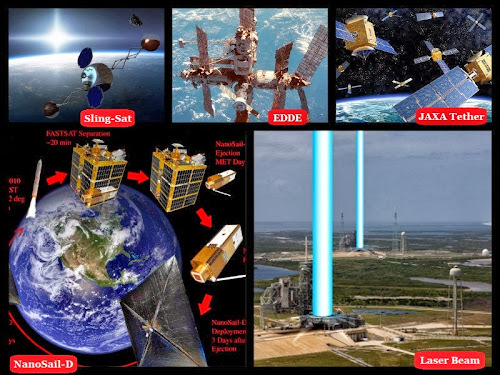 DARPA is currently developing a new spacecraft called the Electrodynamic Debris Eliminator (EDDE). Despite its fancy name, EDDE is a glorified fishing boat. Armed with two hundred nets the vehicle will fly round at low Earth orbit—tracking down and netting pieces of junk. Once it makes a capture, EDDE will hurl the debris towards the open ocean or set it on a trajectory that will destroy it. When it comes to clean up. Even a little satellites can make a big difference. The tiny NanoSail-D is only about the size of a loaf of bread. But, it can unfurl a super thin solar sail. To avoid becoming a piece of space junk NanoSail-D/Solar Sails catches the sun's rays. Propelling itself towards a fiery death in Earth's atmosphere. If we equip all new satellite with solar sails. They'll be able to self-destruct rather than turning into trash. We might even think about attaching solar sails to junk that's already in orbit sending its sailing back to Earth. Slingshots are a classic childhood's weapon. They might also be used to hurl space junk. Two researchers at Texas A&M University have proposed a unique satellite dubbed Sling-Sat. Sling-Sat would capture a piece of debris, whirl around and slingshot the trash to its doom. With the momentum from one throw, the satellite could hurl itself toward its next target—saving on fuel. The latest cosmic cleanup method comes courtesy of the Japan Aerospace Exploration Agency (JAXA). A satellite will carry a metal tether made of aluminum and stainless steel. Which you can attach to a piece of trash. As the tether interacts with Earth's magnetic field. It generates electricity, this slows down the space junk which eventually incenerate in the atmosphere. This technique is in its early stages. Its first trial run is set to launch in February 2014. A JAXA satellite will unfurl and study the tether without destroying any trash. Thank you for reading Different Method on How Scientist Can Clean Debris and Space Junk posted on the website Kwentology if you want to redistribute this article please include the link as the source. Have some kuwento to share? Contact us!